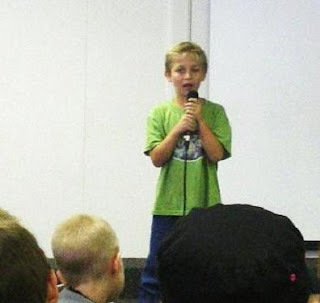 This is my grandson singing in a talent show at school. He loves to sing, and the bigger the crowd the better. He plays the drums too. "you've got mud on your face, a big disgrace, waving your bladder all over the place....."
Hey, that is MY song!!!! OMG! My bladder is all over the place, too! I'm not going to ever stand too close to you if that's what you're waving around. It certainly sounds like he has a money making career! Send him to American Idol! Ah, the national anthem of menopausal and post-menopausal women every where. OMGoodness! Too funny! He takes after his grandmother! Love it! They have a radio thing here about what people think the lyrics are. My son loved a country song that said "I am that man' and I didn't realize why til I heard him belting it out in the bathtub, singing " I am Batman"